Revit teknolojisinde şematik diyagramların kolay ve son derece verimli bir şekilde oluşturulmasını sağlayan yepyeni bir şematik tasarım modülü olan MagiCAD Schematics'i piyasaya sürdük. 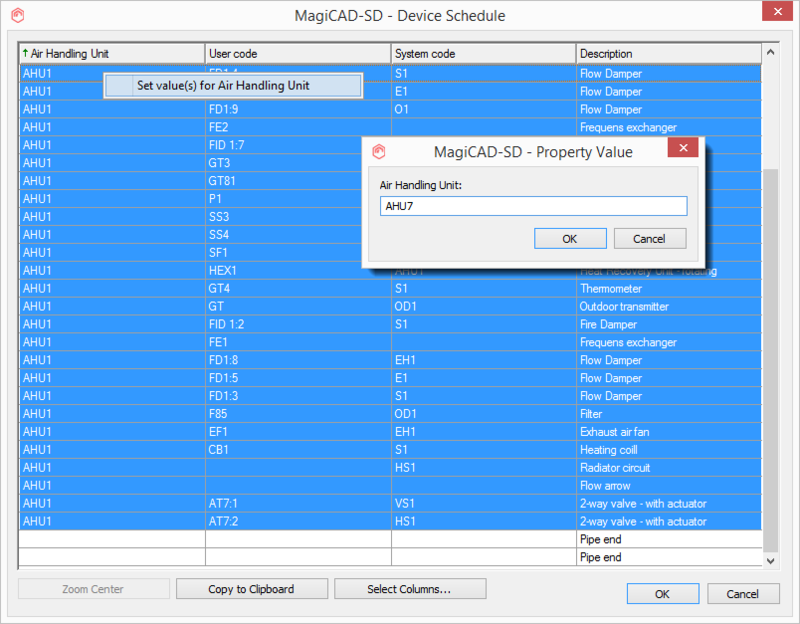 MagiCAD Schematics, şematik çizimler oluşturmanızı, şematik çizimlerdeki sembolleri projedeki ilgili cihazlarla bağlamanızı ve sembol ile cihaz arasında parametre değerlerini senkronize etmenizi sağlar. Özellik değerleri semboller ve cihazlar arasında senkronize edildiğinde bilgilerin diyagramlar, plan çizimleri vb. şekilde proje süreci boyunca güncel kalması sağlanabilir. MagiCAD Schematics makes it easy to install symbols into the schematic drawing and store symbol definitions into the dataset. The symbol definitions allow you to define parameters with default values that will be included in the family when the symbol is installed. Symbols can be organised to user-configurable groups making the correct symbol easy to find on the new symbol installation tool palette. Symbol installation and line drawing are easy, as you can install a symbol simply by dragging and dropping the symbol to the schematic drawing from the tool palette. 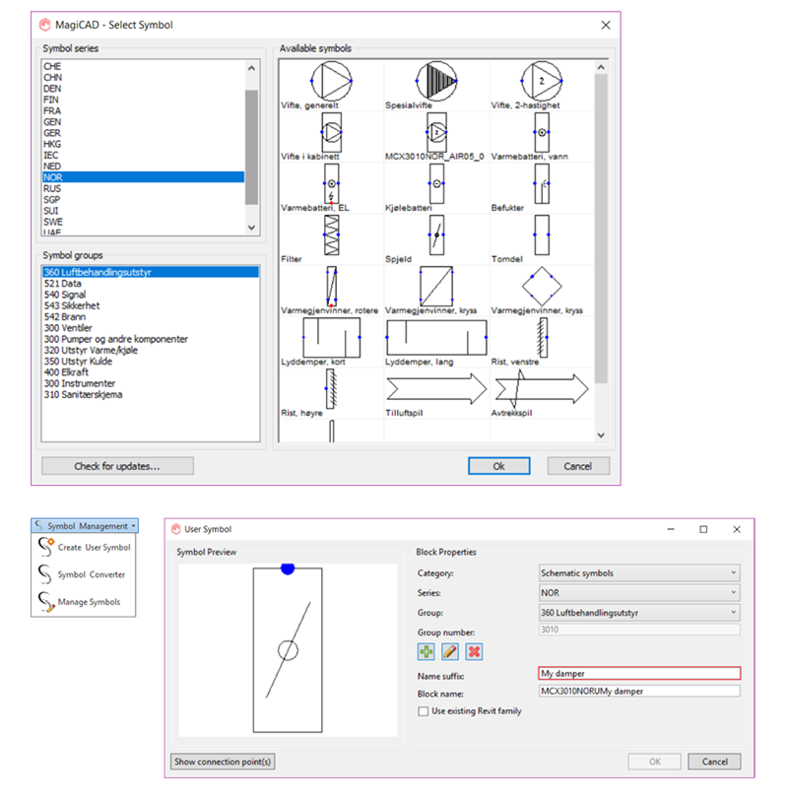 Symbol installation and line drawings are made easy as you can install a symbol simply by dragging and dropping the symbol to the schematics drawing from the tool palette. MagiCAD Schematics’ localised symbol libraries offer tools for creating your own customized symbols. 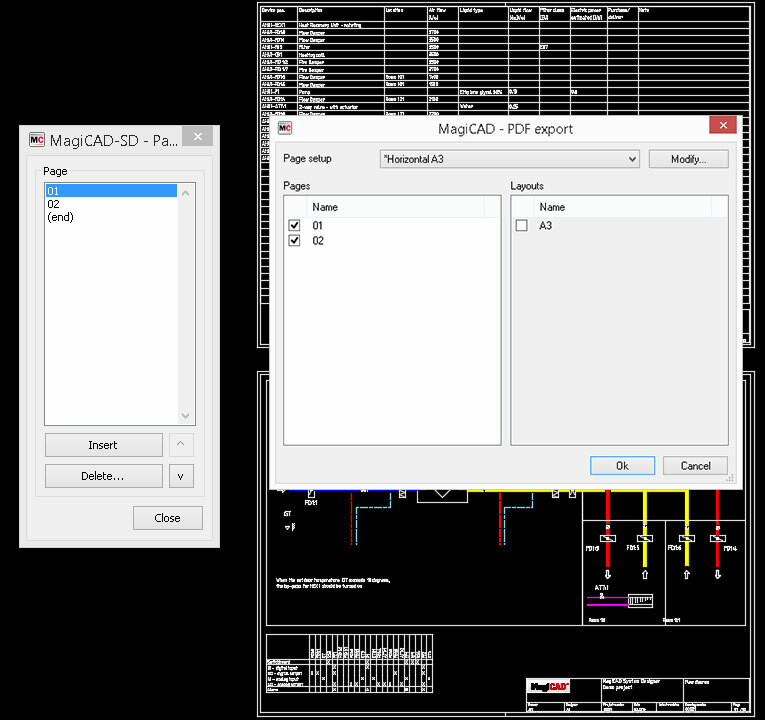 MagiCAD Schematics provides tools for linking symbols or lines in the schematic drawing with corresponding devices in the model, enabling synchronisation of parameter values between the schematics and the model. 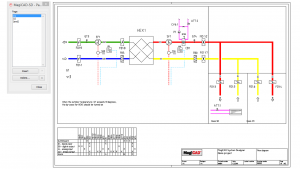 This ensures that that the information stays up to date during the project in diagrams, plan drawings, etc. You can configure and select the parameters to be synchronised and also define the direction of the flow of information, either from the schematic drawing to the model, or vice versa. 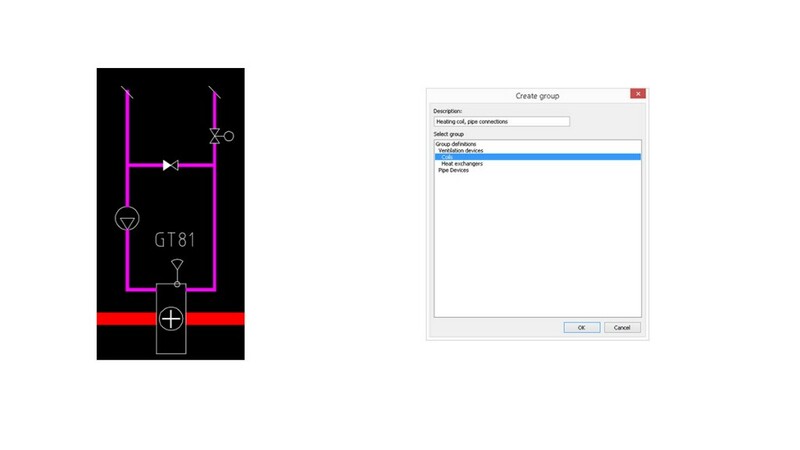 For example, you can begin drawing the schematics with low level of product-related detail. Once the network is modelled and calculated, it is easy to transfer the calculation results together with e.g. device position codes from the model to the schematic drawing. 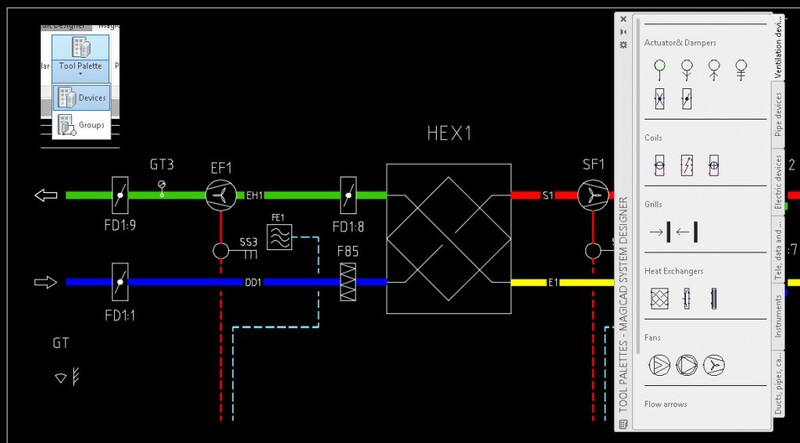 This makes it easy to add tags containing more detailed information to the schematic drawing without additional manual work. 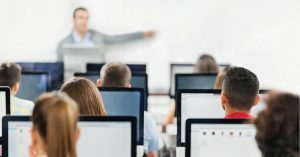 AutoCAD teknolojisinde şematik diyagramların kolay ve son derece verimli bir şekilde oluşturulmasını sağlayan yepyeni bir şematik tasarım modülü olan MagiCAD Schematics'i piyasaya sürdük. MagiCAD Schematics daha önce MagiCAD System Designer olarak mevcut olanı yeniden canlandırır ve geliştirir ve şematik çizimler ile Ventilation & Piping (Havalandırma ve Sıhhi Tesisat) projesi arasında senkronizasyon ve veri paylaşımı sağlar. Özellik değerleri semboller ve cihazlar arasında senkronize edildiğinde bilgilerin diyagramlar, plan çizimleri vb. 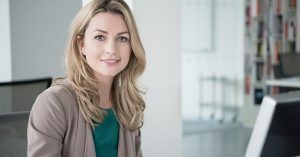 şekilde proje süreci boyunca güncel kalması sağlanabilir. 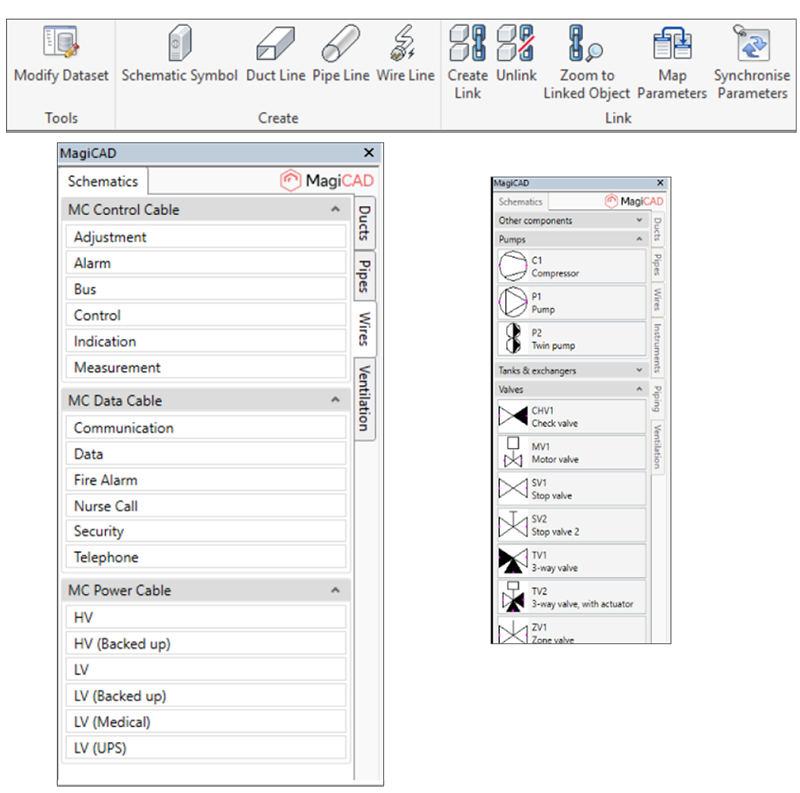 MagiCAD enables a connection between the MagiCAD Ventilation & Piping project and the schematic drawings created with MagiCAD Schematics. 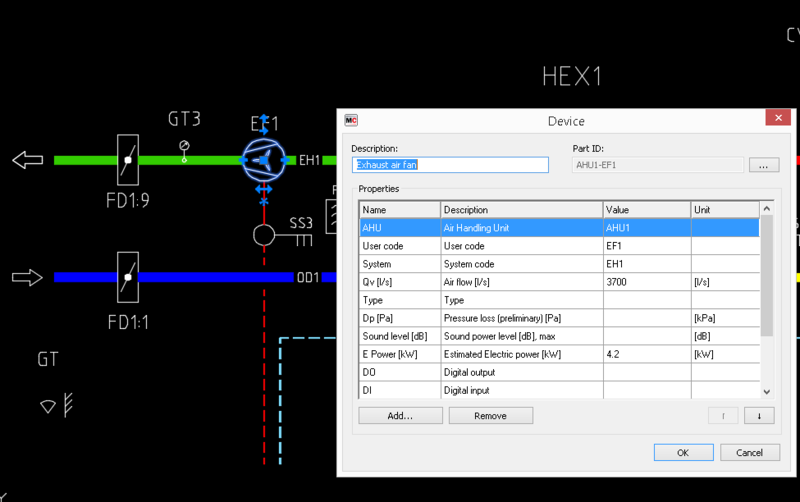 Once the schematic drawing is connected with the project, the same system information is available with both tools. 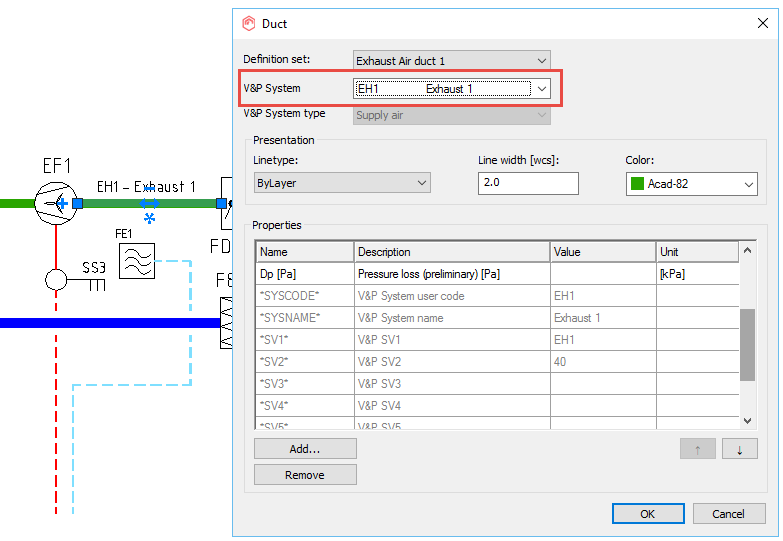 This makes it possible to define systems earlier in the project when creating schematic drawings and then utilise the same system information when modelling the network. 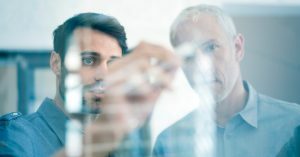 When the system information is stored in one place, it stays up to date in both schematic drawings and the plan drawings when changes are made during the project. 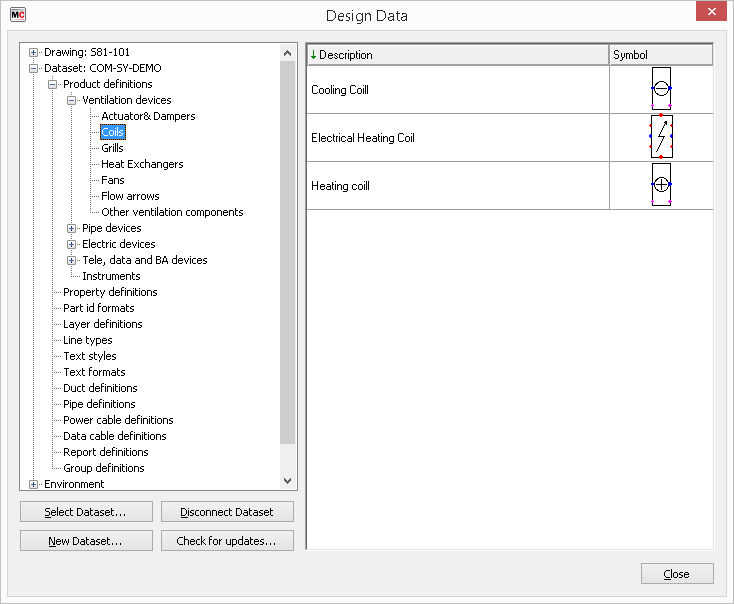 MagiCAD Ventilation & Piping system information can be accessed through the symbols and lines added to the schematic drawings, making it possible for example to tag system temperatures directly to the schematic drawing. 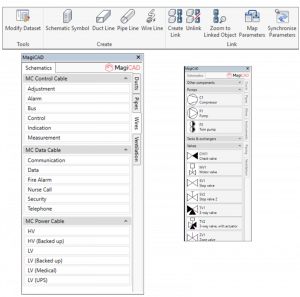 MagiCAD enables you to connect the schematic drawings from MagiCAD Schematics with the Ventilation & Piping project by linking a symbol in the schematic drawing to the corresponding device in the model. 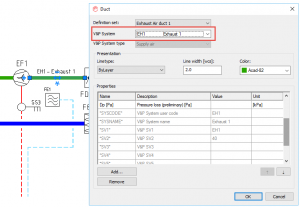 When the schematic drawings and the model are linked, property values can be synchronised between symbols and devices, securing that the information stays up to date throughout the project in diagrams, plan drawings, schedules, etc. 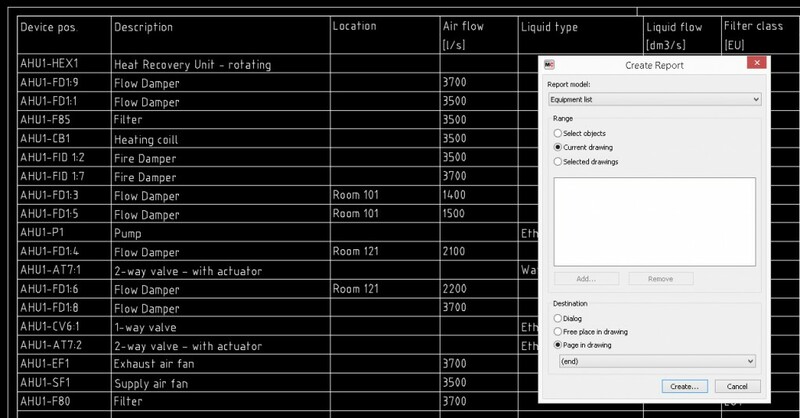 You can configure and select the properties to be synchronised and also define the direction of the flow of information, either from the schematic drawing to the model, or vice versa. Powerful tool for changing property value for multiple symbols at once. MagiCAD Schematics utilises AutoCAD tool palettes which enable symbols and device groups to be dragged and dropped to the drawing. Devices are not just symbols but can contain user-defined data. Properties can be fully customised according to customer needs. 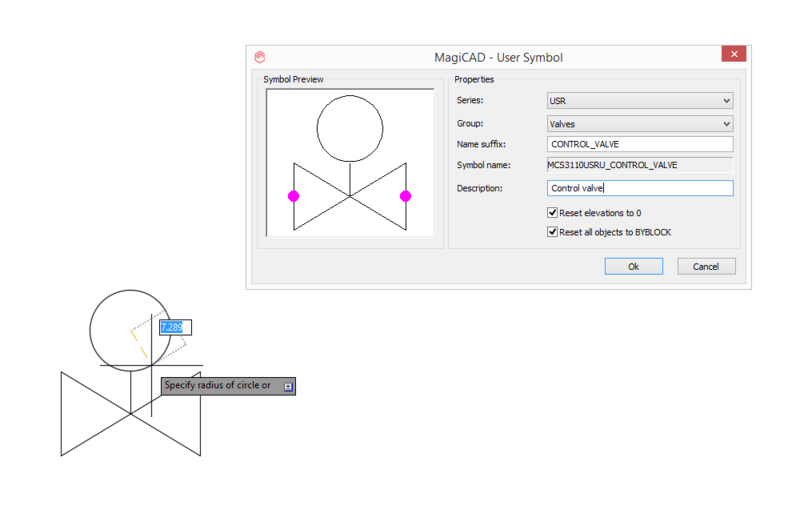 Drawing lines and adding symbols to the drawing is easy and straightforward with MagiCAD Schematics. When a symbol is added, all the necessary connections are established automatically. Adding symbols is easy: you can just drag and drop them from the tool palette to the drawing. The necessary information can be defined for each symbol while adding the symbols or afterwards. The symbol also inherits information from the duct, pipe or cable to which it is connected. Symbols and lines can be combined as pre-defined assemblies and stored to the dataset for later use. This makes for example adding heating coils with pipe connections very convenient. No need to create regularly used configurations over and over again. 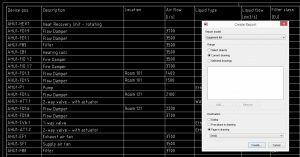 Diagram settings (line types, symbols, properties, report templates etc.) can be stored to external file (dataset) to ensure uniform output of diagrams. Lines, symbols and pre-defined objects, including pipes, cables, valves, ducts, lights, etc., contain data. 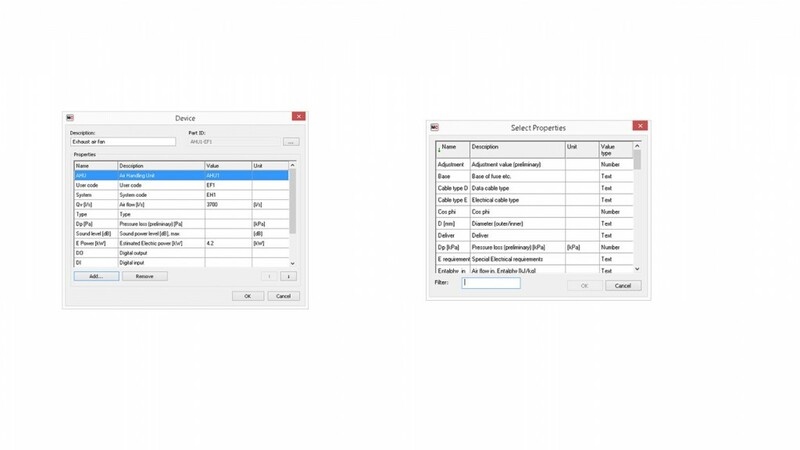 Modifying stored data afterwards is straightforward: it is easy to add and remove properties and you can also change the property values of multiple symbols at once using the Device Schedule tool. Possibility to create user-defined symbols and to use device properties in symbol presentation. 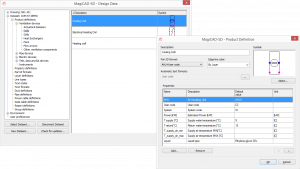 MagiCAD Schematics makes it easy and fast to standardise and start new projects using dataset templates, which can be localised for each market area, company or project. 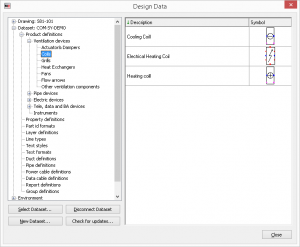 The dataset includes all the necessary settings to ensure uniform format for the schematics in a project, including symbols, data content to be stored, line settings, etc. 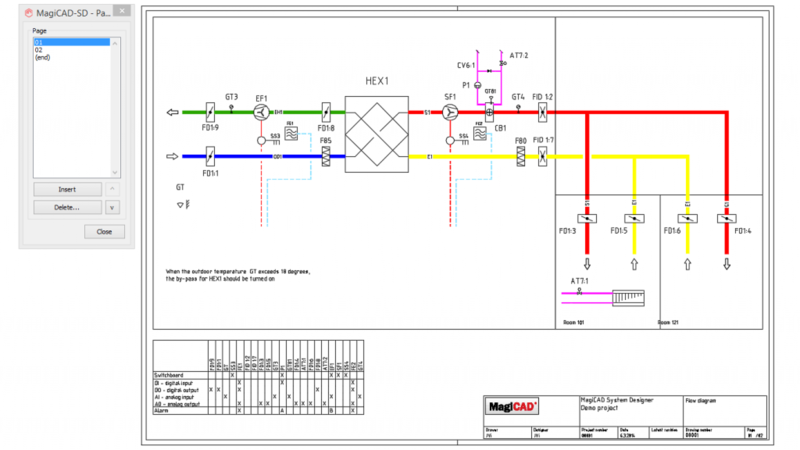 MagiCAD Schematics offers a built-in frame handling system which can be customised for each company or project. It is easy to modify title blocks and add project information. When it is time to plot the schematic drawings, all the frames can be plotted automatically into a single PDF file, saving time when producing paper drawings. Adding dimension texts. Using properties defined for the symbol in dim.text formats. Reports can be attached to the diagram. Reports attached to the diagram is synchronised with symbols and data is updated automatically. 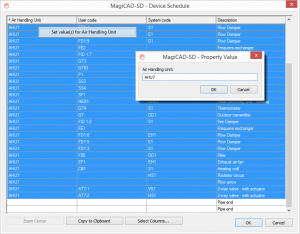 MagiCAD Schematics comes with a tool for producing reports, e.g. 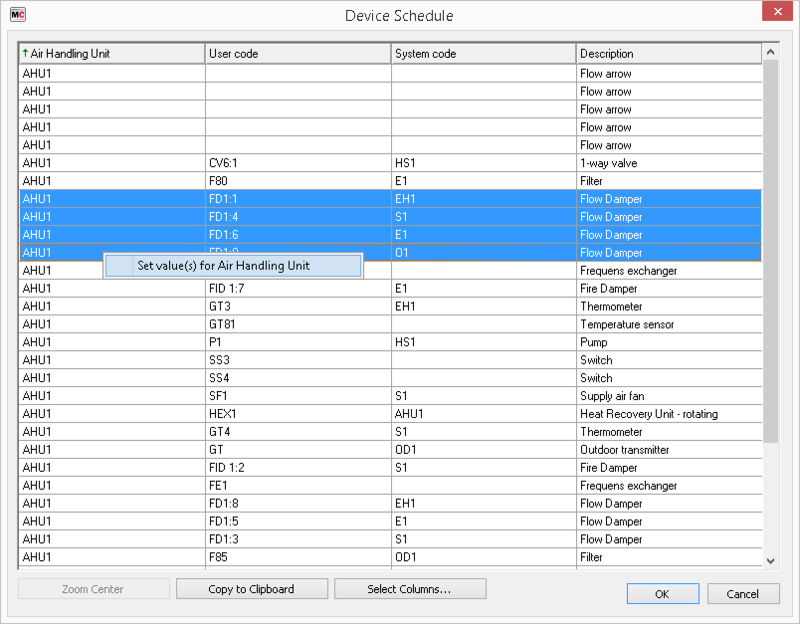 device schedules, based on the content in the schematic drawing. 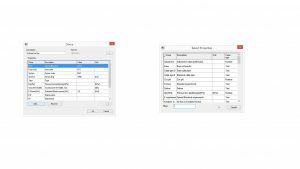 Report settings can be easily configured by the user and stored as a report template to the dataset. One of the most powerful report-related features is the possibility to attach the report directly into the schematic drawing with a two-way link automatically established between the report and the symbol. 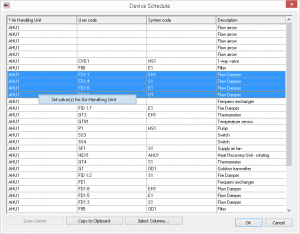 This removes the need to manually make separate updates to the schematic drawings and the device schedule, as both stay up-to-date automatically when information changes in one of them. 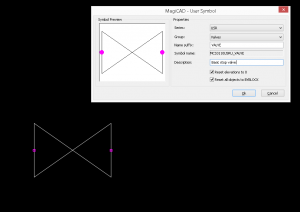 Possibility to create user-defined symbols from AutoCAD objects.